Look no further for a compact and portable guest bed. The Simmons Beauty sleep Foldaway Guest Bed Cot with Memory Foam Mattress, Multiple Sizes could fit your bill perfectly. This guest memory foam bed and has an ultra-plush honeycomb cover that provides the ultimate comfort. The perimeter spring suspension in this guest bed provides a firm yet contouring sleep surface that won't sag. This folding guest bed is a good choice for guest rooms, dorms, vacation homes or any other place that requires an extra bed. Maintenance is easy as you can remove the velour cover and wash it. The memory foam guest bed assembles in minutes. When not in use, you can fold it compactly and put it away in closets or behind cabinets. 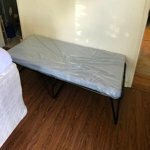 I was looking for a portable replacement for a queen size platform bed and after much research thought I would give this cot a try. I'm 6 foot and 170 pounds and the size is fine. Easy to set up - very light and sturdy. Foam mattress is 2.5 inches of regular foam with a half inch memory foam topper. I took the cover off and added another 1.5 inches of memory foam that I found at Target. Cut that to fit and then put the cover back on. Now its perfect for me and I sleep on it every night. Try it as is then add additional foam if needed. I would definitely recommend and buy again. 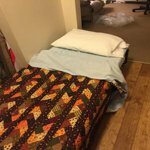 I purchased this bed to keep at my father's assisted living place so I could spend the night with him since I live 2 hours away. It is so comfortable, I slept like a baby on the memory foam mattress. I got the twin size and am glad I did. It easily stores, standing up, in his closet under some shelves. It would store under most beds too. It has a hook which keeps it together when folded and at first I couldn't unhook it but then realized if I just kneel on top of the bed on the floor, it easily unhooked, same for rehooking it to store. I love that I can now spend more time with my 93 year old father since I have a place to stay. 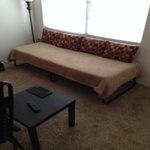 Easy to set up and comfortable. Bought for kids to sleep over at grandparents' but also wanted the flexibility for an adult to use. Folds down to 7 inches and slides under the bed. Twin sheets work well even though a little big. Just tuck under mattress and good to go. I'm 6'-1", 190lbs and have slept on this bed several times now and found it adequately comfortable. It sinks a bit if you concentrate your weight or sit in the middle but other than that it makes for an enjoyable sleep. It is very compact, surprisingly light and solid. There are 2 bolts you need to insert in the legs on each end when you set it up and then remove when you fold it up. it would have been nice if they used a locking pin or something else that didn't need to be inserted and removed each time. 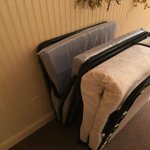 The mattress is stored on the back of the frame before folding but this is pretty simple to do. I fold it up each day and store it out of the way. It only takes about 3 minutes to do. I'm really pleased with the bed so far and would highly recommend it to anyone looking for a simple, light, compact spare bed. This fold-out bed was purchased primarily because of its generous weight limit and good reviews - it was intended to be used for a variety of periodic guests of all shapes and sizes. So far, a 14 yr. boy (6' 2" tall), a 39 yr. old man (approx. 6' 4" tall, 220 lbs. ), and a woman have used this bed and all have raved about how comfortable it was (with 2 of them asking for purchasing information). The sleeping pad is very thin (but according to guests, seems to be more than adequate) and a twin-sized sheet needs to be tucked under considerably on all sides. Once that is done, the bed can be made up normally. I offered to purchase additional sleeping pads to top the thin pad, but all who slept there said that extra pads weren't needed. I cannot stress enough the helpfulness and usefulness of the Walmart 'Reviews' section below items. The reviews are extremely helpful to those wishing to compare products. I made this purchase after comparing different fold-out beds and reading the reviews of each one and I could not be more pleased with this purchase. Thank you. I am 6'1" tall and weigh 255 pounds. 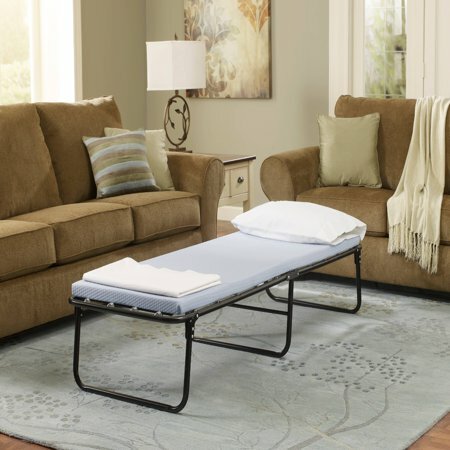 I got this cot to put in my small home office, so I can be on the main floor of my house for an upcoming surgery. I have had 2 spine surgeries and I have been sleeping very good every night. It is sturdy and small enough to fit in a small space. Great value , no real assembly-just take it out of the box and unfold the frame, make sure to put in both of the supplied carriage bolts so the frame does not fold up while in use, takes up very little space and should slide under most bed frames for storage, much better than the air mattress I currently have for oocassional overnight guests. I had purchased this spare bed before and was disappointed when this one arrived. It is a different manufacturer and the mattress is much thinner. In addition, it does not have a locking strap so it does not stay closed when not is use. I am a senior and getting this returned wasn't worth the hassle for the cost. Will not be ordering from Walmart again. Took it out of factory seal and it was FILTHY!! Just got home with my site to store order, opened the box and removed the factory seal plastic, and the thing is FILTHY. Box was completely sealed, this happened at the factory, NOT impressed.... Going to try to add pictures but its just stained all over the bottom.